We highly recommend Mary as we here at Hausermann's have had a long and wonderful business relationship with her for many years. 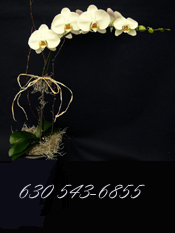 Weddings, Showers, Galas, Parties, Benefits, Dinners or Luncheons in the Chicago area. 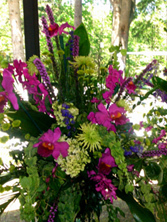 Hausermann's has blooming plants available for any of these occasions. We can provide plants lightly decorated (similar to photo) or provide the plants for your designer. Please call: 630-440-6682 for quotes and availability. Please allow 3-4 weeks notice prior to the event. We have the perfect person for you. Mary Mazzeffi at "A Floral Affair". 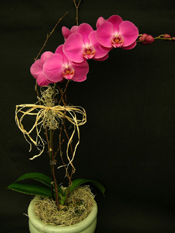 She has a special interest in Cut Orchid Flowers and Orchid Plants but works with all kinds of Cut Flowers, often in combination with orchids. Her designs are always fresh and new to fit any occasion.